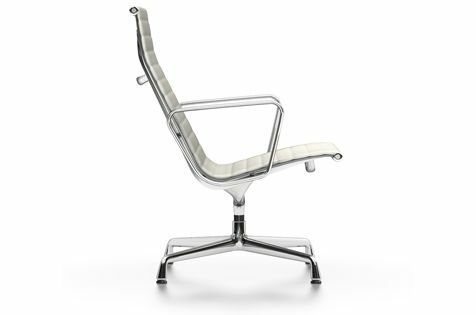 The Aluminium Chairs EA 115 and EA 116 offer superb comfort with their high backrest. The seating height is designed so that users can easily rise from the chair. Both versions are available with fabric, leather or mesh fabric covers in a selection of colours. EA 116 has a swivel seat, while EA 115 has a fixed base. Chair with high backrest. Seat in mesh fabric or upholstered with high-frequency welded horizontal ribbing in Hopsak, Leather or Premium Leather. Side profiles and spreaders in polished or chrome-plated die-cast aluminium. Four-star base in polished or chrome-plated die-cast aluminium. EA 115 non-swivel.